So much for finishing up this morning in the Piper so I can rent on my own to build hours. Honestly, at some point I will have the required hours in type to start flying the club plane.....someday. Today Mary and I took some time to visit with the owner of N28679 the PA28-181 Archer II. Gary is a very nice man, he seemed pretty laid back and a real plus for general aviation. 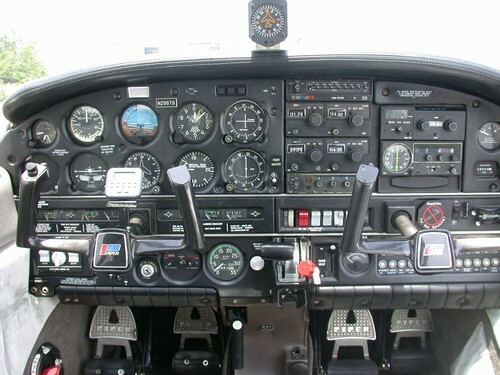 He encouraged me to obtain the IFR and commented on what a nice platform this aircraft will provide. I think the most impressive thing was the absence of the "My plane" phrase. In fact, Gary repeatedly stated that as a club member it's your aircraft and that's the way he wants us all to treat it. I am checking into a CFI based at ILG to fly six seven niner for the minimum 10 hours before taking it up alone. I have 9 to go......heck I may just bag a days work and go on a cross country with my CFI or another from the school I got my license at. Both radios have been replaced, one with a new garmin 300XL and the other I can't remember. The AP is tied to both HI heading bug and the 300XL GPS, so that's a cool feature. The annual is scheduled for November and I already offered to help in any way. I figure may as well learn all I can, Mary and I may be owners sooner then we think. We discussed the fuel arrangements at the home airport and away from home. We also talked about how everyone logs time and the online scheduling system that I already have access to. Overall a great trip to ILG this afternoon. I also managed to hear the aircraft I rent at Brandywine doing T&G's (N2746C) here at ILG on runway 27 ....I guess she was checking up on me or giving the nod of approval. 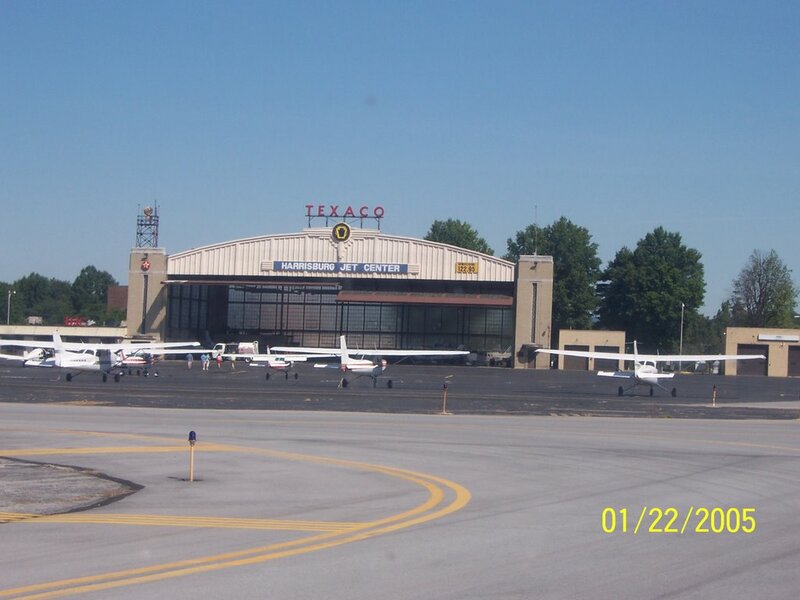 Upcoming flights are in the works for a fly into KAIY Bader Field and trip to Wilkes-Barre just to let Mom and pop know I did it, I have my license. I wish they both were still here to share my dream come true but I guess they really do know. Heck, Pop's picture was taped to my knee board the day of my checkride.....I needed all the extra strength I could get!! Mary and I decided that Sunday would be a great day to visit family in Harrisburg. The weather reports were looking fantastic and we needed a break from the normal routine. This new travel by air deal is pretty cool! We had to be back for a BBQ here in Wilmington, DE by 5:30 pm so "by air" really helped. This is so electrifying……… I have told Gary that I knew when I married him it was going to be a heck of a ride, who would ever had thought literally. Mary and I packed the flight bag and a few things into 46C as I started my preflight. Mary observes as I walk around (usually talking to myself)while completing the check list. It’s a great way for me to learn and understand. Fuel check complete and time to buckle up for a fun day. With the run up complete and all systems looking good we announce and roll out to runway 9 for departure. Turning crosswind and downwind I follow up with a departure on downwind to the west call as we climb to 2000'. Switching frequency to PHL Approach I get a quick response from PHL that they are to busy to help me today........hmmmm....ok, fine we will go at it alone. It was encouraging to see that this didn’t bother Gary, he just shrugged his shoulders and concentrated on flying. 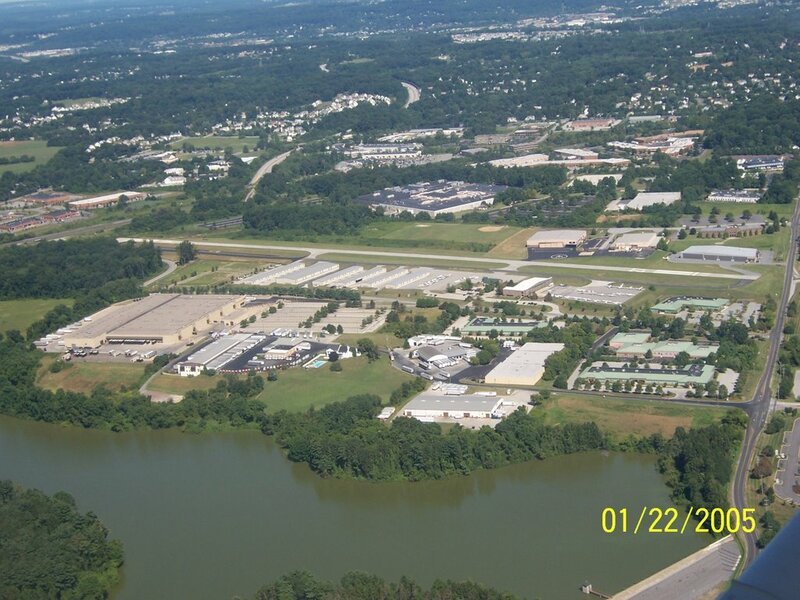 As we approached Harrisburg International I was handed over to Approach on 124.1 . 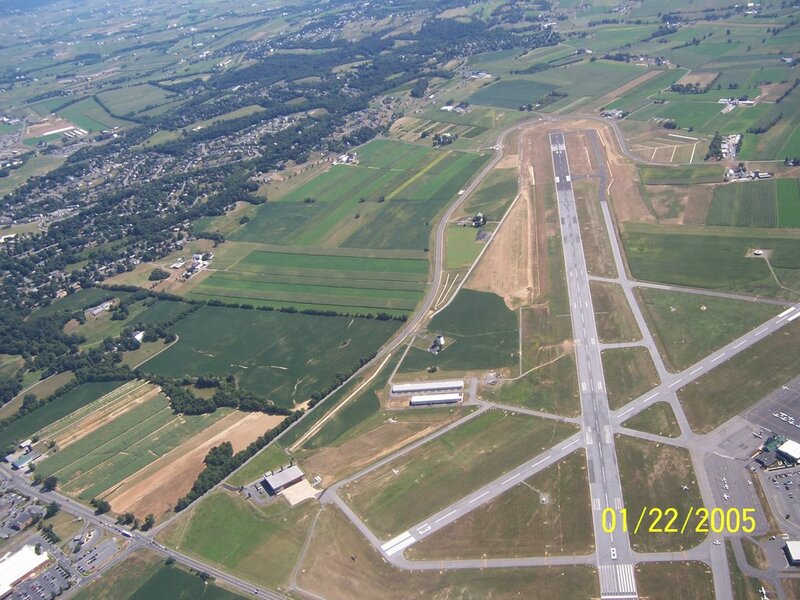 We crossed over the approach of 31 and were directed to follow the west bank for runway 30. I confirmed and made way for CXY. I was quickly handed off to the CXY tower and I thanked Harrisburg for their help. Cap City tower cleared me for landing on 30 and I confirmed. 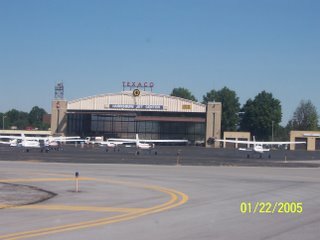 Last notch of flaps and a nice touchdown with a roll out and right turn off to the t/w that takes me to Harrisburg Jet. Nice and easy landing………front parking spot and overall a very sweet trip, great job by the pilot. A call to Ground to call out my final destination as Harrisburg jet and off we go. Switching to unicom HJC sends a lineperson out to direct me to a parking spot. All locked up and our ride waiting we head out the gate to a fun afternoon. Mary and I visited with my cousin Dom and his wife Lisa. It was great to visit and see the children after a long gap in our visits. Their three girls are so nice, well behaved, great manners and did I mention just gorgeous. Obviously looks from their mom......hehehehe had to take a shot at ya' cuz. We had a chance to see all the new additions to the home and just sit and catch up. The pool and landscape looked great and if we had more time I would have been tempted to dive in. Before you knew it, it was time to head back to CXY. We made a stop for some lunch then said our goodbyes. With the new mode of transportation we will be back again to visit soon. 35 minutes in the air beats 2 hours of driving anyday. We saddled up for home and departed around 3:30 requesting taxi for take off for VFR to N99 with information "Q". Departing 26 we were instructed to climb and maintain 2000 then turn to course 180. A short roll and we were off, climbing out as instructed obviously to clear terrain on our 9:00. We then turned to 180* and were handed off to departure. Departure confirmed our intended altitude then gave us a course change to 130* to follow the west bank. After we cleared the Harrisburg International area we were cut loose to proceed on course. Finally in somewhat smooth air after crossing the Susqehanna River. It was really bumpy until we crossed the river and it took a short while for Mary to get comfortable. I actually asked her if she was sleeping........(duh, her eyes were closed......where's my sign) . She said it helps her deal with "bumps". Some what bumpy I’m talking take all the roller coaster’s in Bush Gardens and put that into one ride that was how bumpy it was. Soooooo it was a little unnerving until things started to settle down. Plus he asked me this morning where I got a bruse on my leg………I guess when I was getting smacked around by the plane. Passing south of Chester County and with both water towers in sight I know I am headed home through the gateway to 27 left downwind. I announce my position and follow with the left downwind entry. One aircraft spotted off to our 2:00 that looks to be entering the downwind maybe midfield. The pilot announces his position and I announce ours...we exchange that we have contact and he opt's for a 360* right turn to re-enter. A turn to base and final as the pattern gets busy with numbers 2 and 3 behind us we gently settle in and roll out to our turn off. Final after landing checks complete our journey comes to an end. I benefited from the flying education I received today and I’m so looking forward to our next adventure. We are excited about joining the new "club" and the opportunity to extend our getaways to overnights. More seat time to follow in the Piper, and Mary is going to finish the "companion" course in the schools Piper. Yesterday was my second ride in a low wing. This trip however, had me at the controls. I signed up for an intro to Piper 988LA a PA28-161, hoping to get a handle on what may be in store when Mary and I join the "flying club". The preflight went well, noting differences in the elevator, only three fuel sump locations, and that wing in a really different spot. :) Of course I had to get on my bad knees to check fuel but, you know it has to be done. I think I'll trade the step stool I use for a knee pad, yes, easier on all those scars. I made a few mental notes and will add them to the checklist. Time to climb on in.....not to bad getting up on the wing and folding myself in. I had to take out two notches of flaps so I didn't have to crawl across the handle. I went through the checklists and other then fuel pump status, fuel tank location and no "both" setting I was ok with it all. As we discussed fuel I suggested that I would follow the after hour/before the hour to manage tanks. As we taxi to the run up and complete the checks I am starting to get a bit anxious. This baby steers better on the ground then the Cessna does but it feels so different. It's an easy look to the pattern for traffic as I announce departure followed by a roll into position. Full power and we are off..........Well...eventually...this baby is a tank and it seems happy plodding along. Ok, 55 and climbing more back pressure and we are finally off. Out to the practice area for some turns , slow flight and approach(power off) stalls. Not to bad and I didn't even let the flap handle get out of control. It's click and release the button, it then moves down to the next notch. Back to N99 for some landings as I announce my entry to the pattern. I'm feeling pretty good, knowing this baby sinks like a rock, but under control. Hey what do you know, simulated engine out.......great....as I am on the electric trim my CFI says what? did you think we wouldn't work on this. Trim for best glide speed, announce I am going to make Brandywine the flow through my checks. Fuel pump is on turned on with landing lights (seemed like a good habit) I run through the list cycle fuel pump, switch tanks, mixture, throttle, restart if no fan, no switching to 121.5 I'm staying on to announce to N99. I am past the end of 27 and making my left base "abbreviated" turn inbound. Wow this baby is sinking fast, I actually said out loud this does not look good, it's going to be close. I cut my final tight, really tight, actually turning left almost over the numbers to align with the runway and set it down with a long roll out. I think he was happy I didn't quit and worked it for all I could to get there. That was my last landing, number 4 for the day and I was beat. Geezzz it felt like training all over again! I will schedule more seat time next week. I want to get at least 10 hours in type so that I can make the move to the Archer II. Stayed tuned for the status on joining the club! The minimum monthly base dues are $350.00 per month per member, which reserves the member to 4 hours of Hobbs time flying. Variable fee, if applicable shall be calculated by hours of usage over and above the base of four hours will require additional dues at the rate of $87.50 per Hobbs hour. Dues shall include all operating costs including fuel, oil, maintenance, insurance, and engine / prop reserves. Partial hours will be prorated to the 1/10-hour based on Hobbs reading. NO person may fly Club aircraft without a current and valid medical and pilotÂs certificate, nor may they do so unless they possess a current and valid Annual checkride signed off by a CFI. Each member shall be required to pass at least one check flight every twelve (12) months with a CFI, and insure that the owner or his agent receives all updated information for insurance purposes and the Clubs membership database. Each member who has not flown during the preceding ninety (90) days shall have a check flight with a CFI to establish currency. This gorgeous piper is hangared near our home, and with only a few pilots the availability should be very good. We also thought that this "club" will give us a glimpse of ownership if we pay attention to all the details. 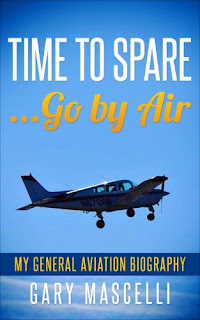 I want to review the documents and do some reading on the AOPA web pages before committing to this venture. Mary and I would also like to get some time in the flight schools piper in order to get a feel for what's in store. On another note, I am flight planning for a short hop to KCXY Capitol City in Harrisburg, PA for this Sunday so that Mary and I can visit with my Cousin and his family. The local wx guru is calling for a great day and I hope he gets it right. We will post pictures and a review when we return. CONVECTIVE SIGMET 8E VALID UNTIL 1155Z MA NH VT CT NY FROM 40NW CON-10E ALB-30NE SAX LINE TS 40 NM WIDE MOV FROM 26030KT. TOPS TO FL300. CONVECTIVE SIGMET 9E VALID UNTIL 1155Z NJ DE MD VA DC FROM 30WSW CYN-30WNW SBY-30SE CSN-10N EMI-30WSW CYN AREA TS MOV FROM 27030KT. TOPS TO FL420. AIRMET IFR...PA OH LE WV MD VA FROM ERI TO 50SW JST TO 40NW CSN TO 30NW GSO TO HMV TO HNN TO CVG TO FWA TO 30S DXO TO ERI OCNL CIG BLW 010/VIS BLW 3SM CLDS/PCPN/BR/FG. CONDS ENDG 12-14Z. .
AIRMET IFR...ME NH MA RI CT FROM 40NE ENE TO 30SSW ENE TO BOS TO 50N ACK TO ACK TO 30WSW PVD TO 20NNW CON TO 40NE ENE OCNL CIG BLW 010/VIS BLW 3SM CLDS/BR/FG. CONDS ENDG 12-14Z. MA RI CT SCT-BKN CI. BECMG 06-09Z SCT-BKN020-030. TOPS 050. BECMG 09-12Z BKN015-025 BKN100. OTLK...MVFR CIG BECMG AFT 16Z VFR WND. PA NJ ERN PA/NJ...SCT CI. BECMG 05-09Z SCT015-025 SCT-BKN100. OCNL VIS 4-6SM BR. 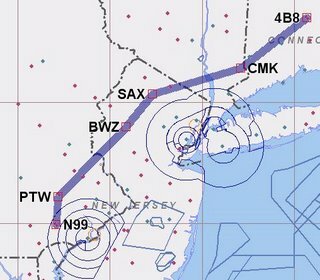 OTLK...VFR. Needless to say a "no-go" decision this morning. I really wanted to be there today to watch the kids play ball and share a trip with my brother to the Mid Atlantic Regionals'. I guess the greatest lessons learned in the last year were patience and professionalism, so here I sit. I know, it's better to be on the ground wishing I was in the air then to be in the air wishing I was on the ground........I don't feel any better. I am looking forward to this weekend and hopefully better weather so Mary and I can take to the sky. The planning is underway for a trip to watch the Delaware State Champions Naamans Little League play in the Mid Atlantic tournament in Bristol, CT. I located an airport just 5-10 minutes from the fields, what a good deal! We, my brother and I,will be flying into 4B8 Robertson Field. After a discussion with the FBO (Interstate Aviation, Inc.), I will be able to take the "curtesy vehicle" for two hours or so to watch the game then return. Of course a top off of the tank and nice tip is in order, Thanks Brian! Approximately 1.5 hours door to door, depending on the winds that morning. I am planning on 5500' with flight following if ATC is not to busy. I will update when we return with any and all photos of flying and the baseball action!! Aircraft reserved at TAS, I just hope the weather holds.